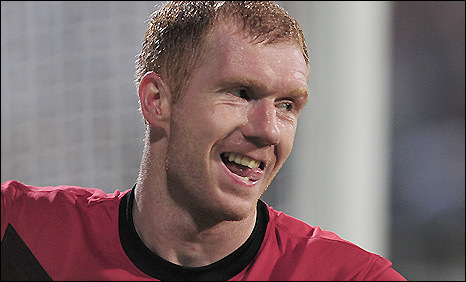 Paul Scholes earned Manchester United a hard-fought win at Besiktas in their opening Champions League Group B game. Scholes steered in a header after Nani's stinging shot had been parried into his path by keeper Hakan Arikan. The goal was reward for United's persistence in trying to find a way through the massed Besiktas ranks in a game of rare chances. The visitors' only scare came when Serdar Ozkan had a shot deflected to safety off centre-back Johnny Evans. Scholes' goal came after United boss Sir Alex Ferguson had taken off disgruntled striker Wayne Rooney and midfielder Michael Carrick for forward pair Dimitar Berbatov and Michael Owen. Rooney went off shaking his head and slammed down his boot after taking it off in the dug-out to reveal his obvious displeasure. But he had made little impact and Ferguson's move paid dividends in a game where United had struggled to unlock a stubborn Besiktas side. United knew a hostile reception at the Inonu Stadium would await them and the fanatical fans did not disappoint with incessant noise wading down from the stands. It was a tough test for last year's Champions League finalists as Besiktas were also keen to appease their passionate supporters following a 3-0 defeat at the hands of arch-rivals Galatasaray last weekend. Ferguson initially opted to use Rooney as a lone striker with left-winger Nani and Antonio Valencia, on the right, providing the width in a five-man midfield. Valencia in particular was having joy as he gave left-back Ibrahim Kas a torrid time with his pace and trickery. But the work-rate and resolute defending of the rest of a Besiktas team which defended in numbers limited the danger. United for the most part were forced to resort to speculative long-range shots, with Rooney dragging an effort wide and Carrick seeing an effort comfortably gathered by Arikan. Besiktas had failed to find the net in their last three games and looked like a team short on confidence and ideas when going forward, especially in the final third. But they did come close to catching United out on a rare foray forward when the visitors' defence backed off as Ozkan ran on goal and his 22-yard shot fizzed just over via a deflection off Evans' thigh. United were given a sight of goal when a cross caused panic in the Besiktas area but Carrick rushed his close-range shot straight at Arikan. And Arikan could do no more than find Scholes when he blocked Nani's shot, the United midfielder taking full advantage to get United's European campaign off to the perfect start. 90:00+3:33 The referee signals the end of the game. 90:00+2:47 Yusuf Simsek produces a cross. 90:00+1:48 The ball is delivered by Dimitar Berbatov. 89:50 Free kick taken by Tomas Sivok. 89:50 Booking Nemanja Vidic receives a caution. 89:40 Unfair challenge on Mert Nobre by Nemanja Vidic results in a free kick. 89:06 Shot by Michael Owen from deep inside the penalty area misses wide to the left of the target. 88:31 Ekrem Dag has an effort at goal from outside the penalty area which goes wide right of the goal. 85:31 Centre by Kahveci Nihat. 84:30 Effort from outside the penalty area by Oliveira Anderson goes wide left of the goal. 83:00 Substitution (Besiktas) makes a substitution, with Kahveci Nihat coming on for Filip Holosko. 83:00 Substitution Ji-Sung Park joins the action as a substitute, replacing Antonio Valencia. 82:39 Inswinging corner taken by Filip Holosko from the right by-line. 82:14 Filip Holosko takes a shot. Patrice Evra gets a block in. 81:30 Yusuf Simsek fouled by Paul Scholes, the ref awards a free kick. Free kick taken by Fabian Ernst. 81:03 Filip Holosko produces a cross, save by Ben Foster. 79:28 Michael Owen challenges Matteo Ferrari unfairly and gives away a free kick. Hakan Arikan restarts play with the free kick. 78:04 The ball is crossed by Antonio Valencia, save by Hakan Arikan. 77:49 The ball is swung over by Luis Nani, clearance by Tomas Sivok. 77:21 Yusuf Simsek delivers the ball, Antonio Valencia gets a block in. 76:17 GOAL - Paul Scholes:Besiktas 0 - 1 Man Utd Paul Scholes grabs a headed goal from inside the penalty box. Besiktas 0-1 Man Utd. 76:05 Luis Nani takes a shot. Save by Hakan Arikan. 74:57 Yusuf Simsek produces a cross, Headed effort from inside the area by Mert Nobre misses to the left of the goal. 74:29 Free kick awarded for a foul by Ekrem Dag on Oliveira Anderson. Direct free kick taken by Oliveira Anderson. 74:03 Free kick awarded for a foul by Ibrahim Kas on Luis Nani. Luis Nani takes the direct free kick. 72:39 The ball is sent over by Antonio Valencia, save by Hakan Arikan. 72:06 Luis Nani takes a shot. Save by Hakan Arikan. 71:45 The official flags Michael Owen offside. Hakan Arikan takes the indirect free kick. 71:16 Antonio Valencia produces a cross, save by Hakan Arikan. 70:58 The referee blows for offside. Jonathan Evans takes the indirect free kick. 69:40 Effort from inside the area by Antonio Valencia misses to the left of the goal. 69:23 Ibrahim Uzulmez crosses the ball, clearance by Nemanja Vidic. 68:38 Substitution (Besiktas) makes a substitution, with Rodrigo Tello coming on for Barbosa Rodrigo Tabata. 68:10 The referee blows for offside. Indirect free kick taken by Hakan Arikan. 67:33 Tomas Sivok gives away a free kick for an unfair challenge on Dimitar Berbatov. Paul Scholes restarts play with the free kick. 66:22 Centre by Luis Nani, Tomas Sivok makes a clearance. 64:34 Ibrahim Uzulmez sends in a cross. 62:39 Hakan Arikan restarts play with the free kick. 62:39 Substitution (Man Utd) makes a substitution, with Michael Owen coming on for Wayne Rooney. 62:39 Substitution Dimitar Berbatov comes on in place of Michael Carrick. 62:39 Wayne Rooney is flagged offside by the assistant referee. 59:48 Luis Nani fouled by Ibrahim Kas, the ref awards a free kick. Luis Nani takes the free kick. 58:20 Substitution Yusuf Simsek on for Serdar Ozkan. 57:24 Short corner taken by Serdar Ozkan. 55:25 Barbosa Rodrigo Tabata takes a shot. Ben Foster makes a save. 53:44 Inswinging corner taken by Luis Nani from the left by-line played to the near post, Fabian Ernst makes a clearance. 53:36 A cross is delivered by Patrice Evra, Ibrahim Kas gets a block in. 53:04 Jonathan Evans restarts play with the free kick. 53:04 Booking Mert Nobre is shown a yellow card for unsporting behaviour. 52:32 Unfair challenge on Jonathan Evans by Mert Nobre results in a free kick. 51:41 Free kick awarded for a foul by Ekrem Dag on Luis Nani. Luis Nani takes the direct free kick. 49:33 Tomas Sivok crosses the ball, Mert Nobre takes a shot. Save made by Ben Foster. 49:00 Antonio Valencia concedes a free kick for a foul on Fabian Ernst. Free kick taken by Fabian Ernst. 48:08 Filip Holosko produces a right-footed shot from 35 yards and went wide right of the net. 46:18 Short corner taken by Serdar Ozkan. 46:10 The ball is crossed by Serdar Ozkan, Jonathan Evans gets a block in. 45:45 Michael Carrick takes a shot. Hakan Arikan makes a save. 45:41 The ball is crossed by Luis Nani. 45:27 A cross is delivered by Antonio Valencia. 45:00+1:03 The players leave the pitch at half time. 44:47 Effort from outside the penalty box by Serdar Ozkan goes wide right of the goal. 43:37 The assistant referee flags for offside against Wayne Rooney. Hakan Arikan takes the free kick. 42:04 Antonio Valencia is flagged offside by the assistant referee. Free kick taken by Hakan Arikan. 40:55 Corner taken right-footed by Serdar Ozkan, save made by Ben Foster. 40:45 The ball is delivered by Serdar Ozkan, clearance made by Jonathan Evans. 38:27 Unfair challenge on Patrice Evra by Barbosa Rodrigo Tabata results in a free kick. Luis Nani has a direct shot on goal from the free kick. 37:22 Antonio Valencia crosses the ball. 35:09 Filip Holosko produces a cross. 34:14 Oliveira Anderson takes a inswinging corner from the right by-line to the near post, clearance made by Serdar Ozkan. 34:03 Antonio Valencia delivers the ball, Ibrahim Uzulmez gets a block in. 32:22 Corner from the left by-line taken by Luis Nani, Nemanja Vidic takes a shot. Save by Hakan Arikan. 32:14 Luis Nani produces a cross, blocked by Fabian Ernst. 31:31 Outswinging corner taken right-footed by Serdar Ozkan from the right by-line, Patrice Evra makes a clearance. 30:59 Headed effort from deep inside the area by Wayne Rooney misses to the left of the goal. 30:43 Antonio Valencia crosses the ball, Matteo Ferrari makes a clearance. 28:22 Oliveira Anderson gives away a free kick for an unfair challenge on Tomas Sivok. Ibrahim Kas takes the free kick. 26:48 Outswinging corner taken right-footed by Serdar Ozkan from the right by-line, Luis Nani makes a clearance. 26:37 Corner taken right-footed by Serdar Ozkan. 26:15 Corner taken right-footed by Serdar Ozkan. 25:47 Serdar Ozkan takes a shot. Nemanja Vidic gets a block in. 25:05 The ball is crossed by Wayne Rooney. 24:25 The ball is swung over by Patrice Evra, Shot from close in by Michael Carrick misses to the left of the target. 23:39 Fabian Ernst concedes a free kick for a foul on Oliveira Anderson. Paul Scholes takes the free kick. 22:59 Antonio Valencia sends in a cross, Hakan Arikan makes a save. 20:39 The assistant referee signals for offside against Wayne Rooney. Free kick taken by Hakan Arikan. 19:42 Serdar Ozkan takes a short corner. 19:33 Serdar Ozkan crosses the ball, Gary Neville gets a block in. 18:21 Serdar Ozkan crosses the ball. 15:13 The official flags Filip Holosko offside. Ben Foster takes the indirect free kick. 14:11 Luis Nani takes a shot. 13:28 Luis Nani takes a inswinging corner. 13:22 Centre by Patrice Evra, Ibrahim Kas gets a block in. 11:58 Michael Carrick takes a shot. Save by Hakan Arikan. 10:23 Jonathan Evans challenges Mert Nobre unfairly and gives away a free kick. Mert Nobre crosses the ball from the free kick right-footed from right wing. 8:50 The ball is crossed by Antonio Valencia, clearance made by Matteo Ferrari. 8:08 The ball is swung over by Antonio Valencia, clearance made by Matteo Ferrari. 5:33 Direct free kick taken by Luis Nani. 5:33 Booking Tomas Sivok receives a yellow card for unsporting behaviour. 5:26 Foul by Tomas Sivok on Wayne Rooney, free kick awarded. 4:44 Free kick awarded for a foul by Luis Nani on Ibrahim Kas. Ibrahim Kas takes the free kick. 3:45 Shot by Mert Nobre from 20 yards. Jonathan Evans gets a block in. 2:15 Tomas Sivok concedes a free kick for a foul on Wayne Rooney. Oliveira Anderson restarts play with the free kick.